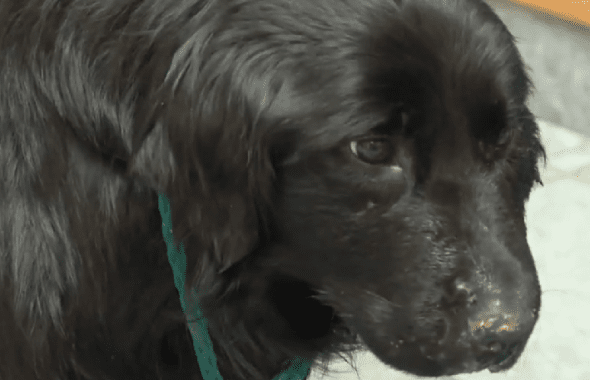 Shadow had been missing from his home for about three weeks when a stranger came to his rescue. He was in bad shape and without the kindness of his rescuer he may not have survived much longer. Shadow went missing from his home in Caledonia, Nova Scotia on May 6th. He had run into the woods near his home and never returned. His owner, Lila Westaway desperately searched for him. Craig Mercer was on a fishing trip with some friends about 10 miles from Westaways’ home when they came across Shadow in the woods. He had porcupine quills all over his face that were causing a serious infection and made it almost impossible for him to even eat. Mercer and his group of friends attempted to catch Shadow several times but with no luck. Mercer refused to keep trying though. “You couldn’t live with yourself if you knew that dog was out there and we just drove home kind of thing,” said Mercer. So Mercer tried again on his own and was able to save Shadow and put him in his truck. Mercer then took Shadow to the vet where he was treated for his serious infection. Veterinarian Kathryn Sykes believes that without Mercer saving Shadow when he did, Shadow might not have survived much longer. Shadow is recovering though and is expected to go home with Westaway by the end of this week. Mercer not only saved Shadow in the nick of time, he paid for all of his treatment. “I made that decisions when I saw the dog and I don’t want to impart that decision on (Westaway), so, I’ll take care of it, “Mercer said. Westaway is extremely grateful to Mercer, for saving Shadow and his generosity. “I’d say ‘thank you,’ but I don’t know how to say thank you so much. I’m just so happy,” said Westaway. Truly an angel from heaven for this poor pup. He was suffering a terrible fate and it was a miracle that 1. you found him and 2. that you had the human-ness to go back for him. I could marry a man like that! Tears of thanks for you, Mr. Mercer, for saving his life. The kindness and compassion of strangers who step up to the plate and ask for nothing in return except the well being of those saved is a testament to your character. If you have children, what a wonderful role model/hero you must be for them. Thank you so much for your kindness! I cried watching the news report. The worlds a better place with you in it!